Entering the 21st century, the world community began to realize the danger posed by the use of synthetic chemicals in agriculture. People getting wise in choosing food that is safe for health and environmentally friendly. Healthy lifestyle with the slogan Back to Nature has become a new trend to leave the old life patterns that use non-natural chemicals, such as fertilizers, chemical pesticides and synthetic growth hormones in agricultural production. A healthy and nutritious food high can be produced with the new method, known as organic farming. Organic agriculture is a cultivation technique that relies on natural ingredients without the use of synthetic chemicals. The main purpose of organic agriculture is to provide agricultural products, especially food which is safe for the health of producers and consumers and does not damage the environment. Thus a healthy lifestyle has been institutionalized internationally, which requires the assurance that agricultural products should be safe to eat labeled (food safety attributes), high nutrient content (nutritional attributes) and environmentally friendly (eco-labeling attributes). Consumer preferences such as these cause the world demand for organic agricultural products increased rapidly.Indonesia has a wealth of unique tropical bio-resources, abundance of sunlight, water and land, and culture that respects nature, organic farming potential is huge. World market of organic agricultural products increased 20% per year, therefore the development of organic agriculture need to be prioritized in high economic-value crops to meet domestic and export markets. Land area available for organic farming in Indonesia is very big. Of the 75.5 million ha of land that can be used for agriculture, only about 25.7 million ha have been cultivated for rice fields and plantations (CBS, 2000). Organic farming requires that land use is not or has not been polluted by chemicals and have good accessibility. The quality and extent of a consideration in the selection of land. Land that has not polluted the land that has not been attempted, but generally given less fertile land. Generally fertile land has been cultivated intensively with the use of chemical fertilizers and pesticides. Using this kind of land conversion requires a long period, which is about 2 years. Volume of organic agricultural products to reach 5-7% of total agricultural products traded in international markets. Largely supplied by developed countries such as Australia, America and Europe. In Asia, the market for organic agricultural products more dominated by the far eastern countries like Japan, Taiwan and Korea. there is no certainty the market, so that farmers are reluctant to produce commodities. Planting areas of organic farming, Australia and Oceania has the largest land which is about 7.7 million ha. Europe, Latin America and North America amounted to approximately 4.2 million, 3.7 million and 1.3 million hectares. Planting areas of organic agricultural commodities in Asia and Africa are still relatively low at around 0.09 million and 0.06 million hectares (Table 1). Vegetables, coffee and tea dominate the international market of organic agricultural products in addition to farm products. technology to support organic farming is enough available such as making compost, planting without soil, bio-pesticides and others. Further development of organic agriculture in Indonesia should aim to meet global market demand. Therefore exotic commodities such as vegetables and coffee and tea plantations that have export potential is bright enough to be developed. Coffee products, for example, Indonesia is the second largest exporter after Brazil, but in the international market of Indonesian coffee has no trademark. Development of organic farming in Indonesia did not yet require a new institutional structure, because this system is almost the same as intensive agriculture such as this. Farmer institutions such as farmer groups, cooperatives, associations or corporations are still very relevant. However, the most important agricultural institutions must be able to strengthen the bargaining position of farmers. In recent years, modern organic farming into the agricultural system Indonesia sporadic and small. Developing modern organic farming produces food that is safe for health and environment-friendly production systems. But in general the concept of modern organic farming has not been known and still widely questioned. The emphasis is more to the left while the use of synthetic pesticides. With the growing knowledge and technology, health, environment, microbiology, chemistry, molecular biology, biochemistry and others, organic farming continues to grow. 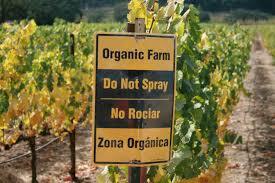 In modern organic farming systems required quality standards and is enforced by importing countries with very strict. Frequently one of organic agricultural products must be returned to the exporting countries including Indonesia because they still found the content of pesticide residues and other chemicals. Local Certification for the domestic market share. Agricultural activities is still tolerate the use of synthetic chemical fertilizers in a minimal amount or Low External Input Sustainable Agriculture (LEISA), but have very limited use of synthetic pesticides. Pest control by using the biopesticide, tolerant varieties, as well as biological agents. The team to formulate a national certification has been established by the Ministry of Agriculture with the involvement of universities and other parties concerned. International certification for export shares and certain circles in the country, such as the certification issued by or Skål or IFOAM. Some of the requirements that must be met, including the conversion of land, storage of organic products, seeds, fertilizers and pesticides as well as processing results must meet certain requirements as organic agricultural products. Several prospective commodity that can be developed with organic farming systems in Indonesia, among other food crops, horticulture, plantation, spices and medicinal plants, and livestock.